Are you a registered nurse looking for more casual work? Or are you looking to get out of the hospital to work casual days through flu season? The flu vaccination season is bonkers! With an increase in the incidence and severity of the flu, more people are realising the importance of getting vaccinated and more workplaces are making this a standard offering to their staff. At such a busy time, agencies are often short of nurse immunisers and staff often have multiple shifts to choose from each day. Conditions are fantastic with a 4-hour minimum pay per shift and driving time between sites is counted as time worked. So what do you do if you want to take advantage of this busy time and make hay whilst the sun shines? Firstly you need to be qualified. All states have different laws and legislation when it comes to immunisations. 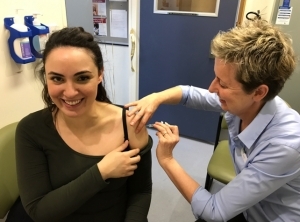 For nurses in SA, WA & NT you do not need to have an Independent Nurse Immuniser qualification, however, this is usually preferred by many employers. In all other states, you are required to have completed an Independent Nurse Immuniser course. There are quite a number of different training providers you can study through and most can be studied externally as an online student. The link below has a list of the major/preferred course providers for each state in Australia. Agencies play an active role in seeking work for you and negotiating your working terms, conditions & pay. If you are already connected to an agency or two, remember to let them know that you have updated your qualifications - this will mean they can start offering you more work in these areas! Becoming a qualified Independent Nurse Immuniser could give you the change of scenery you are looking for! Nurses love this kind of work & being a part of the community. Here is some feedback from a recent survey of nurse immunisers! “Work was enjoyable and satisfying… got me out of the office”. For more information on becomming a nurse immuniser, contact an agency in your area today.